No detail of my confirmation viva, nor the destruction I’ve caused to my nerves, would come close to describing the relief I feel today. I am pleased to confirm that I’m through! After a meeting of over an hour followed by an agonising twenty-minute deliberation – whilst my supervisors and I waited outside, I was given some recommendations and informed that I am now a confirmed PhD student. This sounds like zero progress, but this is huge considering I faced being kicked off the programme in October. The letter of my unsatisfactory performance was as recent as January 14th. What does this mean now? It means with doing the recommendations of the panel (which add about three months work) I can move ahead with the research. I have received a nod from the university for the topic and how I intend to study it. I have successful defended its potential theoretical contribution and (less importantly) its practical. I can move ahead with the empirical work soon. The recommendations are sound and although they will add three months work now, they will save a some time during the analysis stage- so I’m hoping to remain on target for a completion in 2016. Anything beyond that would be financially, psychologically and probably physically no longer feasible. Today I will just remind myself that I’ve passed, upgraded, transferred, confirmed or whatever the hell anyone wants to call it. Posted on February 25, 2015 March 5, 2015 Categories Chronicle, HoopsTags confirmation, literature, management, motivation, phd, postgraduate, process, proposal, research, review, student, study, supervisor, surrey, transfer, university, upgrade, workingLeave a comment on Confirmed! From good to bad this week – but nothing unplanned. A business trip, followed by a week’s training (with evening group work) left zero time for PhD. Next week is another work trip – this time to London. I will take a few days after including a weekend to get some serious work done. I managed to get access (24 hours) to the library at my old university. I should be able to spend some quality catch-up time if I stay behind after the meetings. Ok so I’m not doing enough reading and my ‘draft’ of my draft literature review was a source of concern. After a tough meeting with my supervisors, and dinner with my second supervisor, we have agreed weekly conference (Skype) calls to ensure I’m reading the right and relevant material – not secondary sources such as text books. I need to do a full upload of everything written about Motivation over the past 60 years. Like keeping fit, or controlling weight, this is simple but not easy. Posted on November 24, 2012 July 26, 2014 Categories Chronicle, FrustrationTags management, phd, process, research, student, study, universityLeave a comment on Not Good Enough! I mentioned this book before when I came across it in an article in The Guardian’s archives. 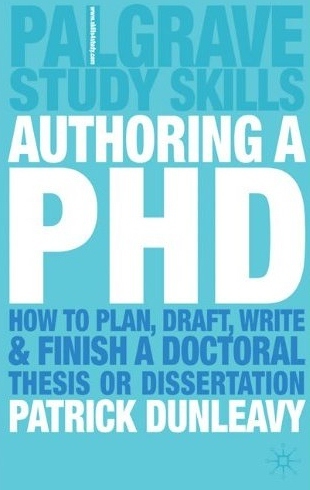 After reading ‘Authoring a PhD’ I wanted a book that described the process of research and what doing a PhD involves, rather than just writing the thesis. This is without doubt an excellent reference if you’re looking for an overall description of virtually everything. For example, it sheds light on the vagueness associated with words such as ‘originality’ and describes how a ‘Literature Review’ should be made relevant – something I noticed missing in some of the theses I’ve been scanning. Another chapter I found very useful is the one about the relationship with the supervisor(s). 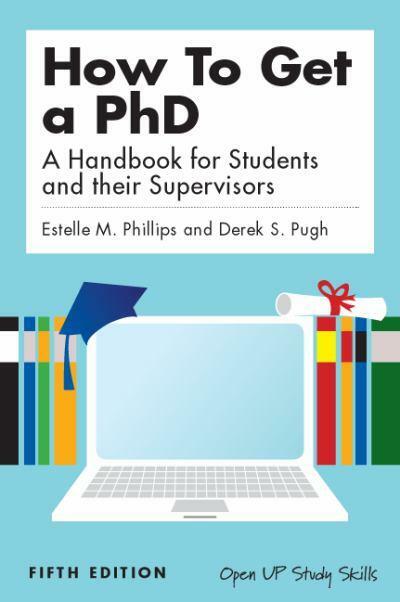 It gets great reviews on Amazon and I agree that it’s an excellent start – and companion – to anyone doing a PhD. I read the older edition (my wife found it among her books from her PhD days). The current one is the fifth and you can find it here and there is a Kindle version too. Having read the many positive reviews this book gets on Amazon, I thought it was time I had a look at it before my reading time becomes more focussed on my research. I’m still not 100% sure about my place on a programme but it’s looking good and my offer letter will be with me ‘in the next few weeks’ according to Admissions. This book, in my opinion, is a little too long. I find myself skipping paragraphs and sections. Having said that, if I had to remove a section I would find it difficult to choose – so this is probably an unfair criticism. The chapter summaries are very useful if, like me, you’re looking for a quick read. It is very well written and covers everything about ‘authoring’ hence the title. It’s not a book about doing a PhD which is probably what I need to be reading at this stage. It’s more about the thesis itself and research planning. I need to know/learn more about the actual process, expectations of and from supervisors. Photons of light are racing through the tunnel giving me hope of a start. I’ve learned in the past few months to assume the worst, and this light should therefore be considered as nothing but a speeding train racing toward me before I can contemplate which way to jump. It does look a little better than that, I admit, and I will know for sure in the next ‘few weeks’. Until then I am again able to start making some plans, reading up on the subject of my research, and even starting to think how to introduce more focus into it. Christmas and new year’s holiday is over so I should be hearing soon. All I know is that it won’t be a January start. I have been working so long in industry that I take it for granted how a customer is always King. My adventure with applications to different universities has been mixed to say the least. Websites are not updated and many links are corrupted. Faculty are working in silos and there is no focal point from the university’s side to talk about a particular research idea. The structure of the programme is only clearly presented by some institutions; and the guidelines are clear and detailed but often miss something as fundamental as a start date! I can’t help thinking that if I worked this way in my current, how many orders would we have missed? The first step is to identify a potential supervisor which means it is my job to read the profiles of faculty and contact them with my proposal. To me it sounds strange that I, the customer, will do this work. The Admissions people simply advise you to contact the relevant experts. I understand why this is necessary, but there is no way of knowing who is and, more importantly, is not available to supervise! I am often writing to a professor and finding out a week or so later that he or she is not taking on new students. Only a couple forwarded my proposal internally to colleagues (why this is not the norm makes me want to punch my screen) and only one of those replied. Of all the universities I considered, only one profile of one faculty member mentioned that he was looking for students. It is simple. But frankly not simple enough. It lacks a logic that I believe exists in the pragmatic and effective commercial world. The theoretical nature of academia means I am having to make people look down through the clouds at the real world in order to move things along. This is step one and not one I can simply bypass. It’s the heart of any application not only from the point of view of presenting what I intend to do for my PhD, but also to crystalise it in my own mind. I’m happy with the subject and I’m sure of its merit – but I need to commit it to paper. It needs to flow and make sense to someone other than my wife and best friend. It’s time to shut away from the world. Reread the research methods books and contact some people to see if I can negotiate access to collect data. It’s exciting if only for having a clear objective for the next few weeks. I have to be ready to apply by the end of this month!